I know I read it somewhere, but can someone tell me what fastest code speed sent by hand was? If you know who was and when? This question got me to thinking. Who would be interested in having a just for fun Morse Speed contest. I think it might be fun to have it on a wire for anyone to participate. Les, Is there a way you could set up a wire so a person could check his or her code speed with the speed average displayed after the code was sent? In the meantime, you can get a rough estimate of your speed by sending the word MORSE over and over for a minute, and count the number of times you sent it. Harry Turner demonstrated correct transmission of 35 wpm on a standard key in 1942 at Camp Crowder (if I recall correctly). Harry was a member of the MTC Toledo Chapter. I have his straight key, which is now part of the MTC archive for future display. He was present at a number of our Morse Day events “back in the day” when Uncle Wes provided our nationwide wire. Harry was also a ham, but I have forgotten his call sign. What kind of key is it? It’s a standard Bunnell steel lever key mounted on a j38 base. Harry etched his name into the underside of the Bakelite base. When he passed away, the key and some of his related telegraph items ended up with our TD chapter members. By the way, I used to pull it out for the “Straight Key Night” event now and then. Now that I have dropped my ARRL membership and refuse to participate in any of their events, I won’t participate in SKN or the like anymore. The key remains stored away with other telegraph items we retain for use in exhibits or museum projects. A true pro wouldn’t need a fancy key! Of course, they probably didn’t have the fancy high dollar Italian ones back then. tell me if that is what it is? I really would like to know. I've attached a photo of one I just found on the net. 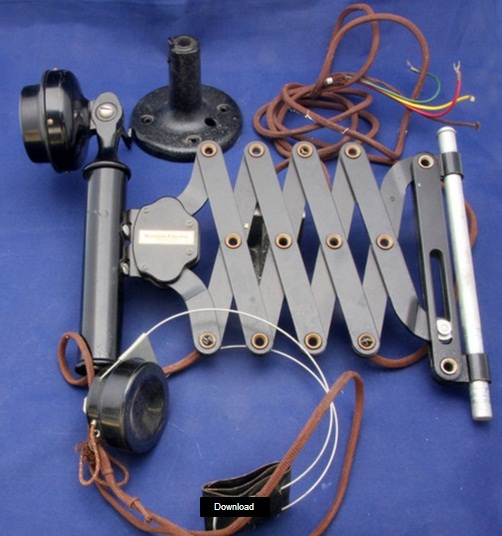 I do have access to a couple of these, one at the local RR museum and one at the AWA and could take further photos if you wish but all the photos I have taken don't show the detail this image does (as the scissors phone was not the object of my photos). 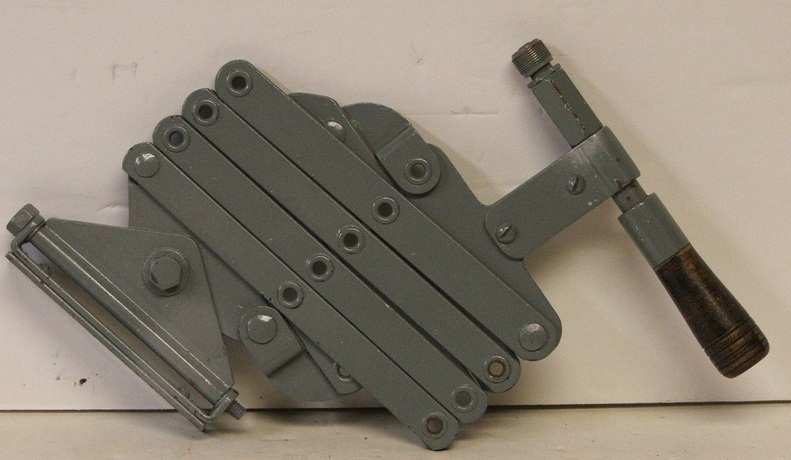 Note that the bottom of the rod shown on the lower right side of this image fits into the table mounted base shown in the upper left center of the photo. The eBay unit seems to be some kind of wall mount and I'm not sure to what that fitting on the upper right side of the eBay unit would have attached. Although not quite identical, I have a very old shaving mirror at my summer place which is on a scissors mount much like the eBay one. You could pull it close so you could see what you were doing with that straight razor and not cut yourself. 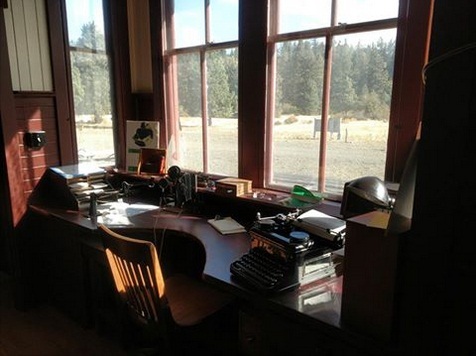 Here is the telegraph office in museum at the former Milwaukee Road Depot at South Cle Elum, Washington, “CM” office. The candlestick phone on the scissors jack (I’m not sure about the actual name of the device). Below the desk, a foot operated “push to talk” button, so the operator could send hands free (needing both hands to type train orders, for example). The Cle Elum Depot, like some stations, had a mix of telegraph and phone equipment in use at the same time. Former Milwaukee Road operator Doug Nighswonger demonstrates the train order operators pose (although phone and telegraph likely wouldn’t be in use at the same time). I want to clarify, telegraph and telephone might be in operation at a depot, but they wouldn’t be us use at the same moment. The circuit selector would be a limiting factor. Download one of the MorseKop versions by Les Kerr and listen on several wires. So nice to hear this klik klak, klikertie klak, click clack or....... no, its sounds something different i think. 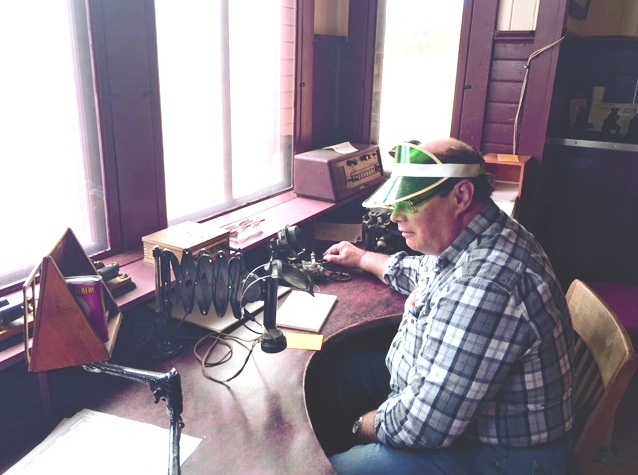 Lee has demonstrated dedication to the art and skill of conversational telegraphy with fellow Straight Key Century Club Members through the use of manual keying devices for 300 minutes of documented Morse Code communication. In addition, Lee has carefully documented 300 minutes of telegraphy on the 40 meter band. Manual keying devices are an Straight Key SK, a SideSwiper Key SSK / Double Speed Key DSK or an Semi Automatic Key /SAK/BUG. After that, I saw the beautiful bug work of F8DGY in QSO with UA3AMY. Have a nice week(end) gents, BCNU. I have seen the GRIM, unfortunately he has seen me to i think.